Americans are taking their medicine. 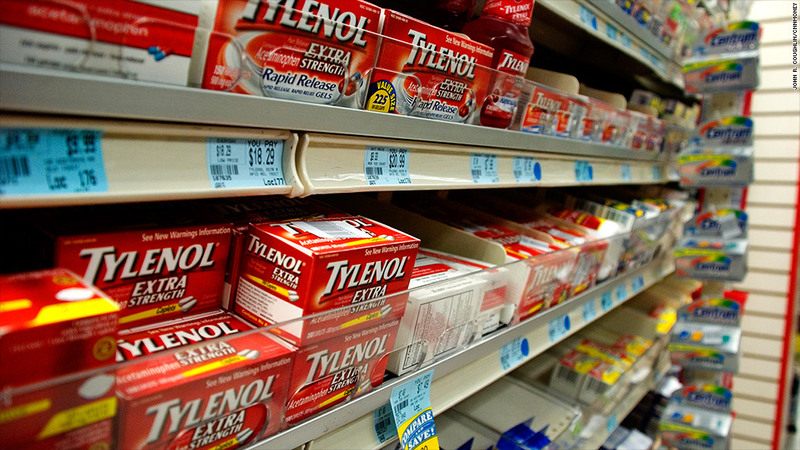 Strong sales of staples like Tylenol and Motrin helped Johnson & Johnson (JNJ)hit record quarterly revenues in the spring, beating Wall Street expectations. Americans have also been stocking up on anti-smoking aids, baby products, Aveeno skin care products and even Listerine mouthwash, according to the company. The consumer brands giant brought in $19.5 billion between March and June, good enough for a 13% jump in earnings. "We're also focusing on 12 mega brands including Listerine, Aveeno, Tylenol and Johnson's baby to ensure they are exceeding consumers' expectations around the world," said Chairman and CEO Alex Gorksy during an earnings call. "And the strategy is working." One of the few areas that wasn't doing well for the company was feminine hygiene products. Johnson and Johnson owns brands such as Carefree, Stayfree and o.b. Drug money: While most people know Johnson & Johnson for its consumer brands unit, the company's biggest segment is pharmaceutical sales, which jumped by more than a fifth worldwide. Much of that bump was driven by Hepatitis C drug Olysio. It brought in more than $1 of every $25 in sales for Johnson & Johnson. The company said that 97% of Hep C cases in the world's seven biggest economies remain untreated. But Olysio is just one part of a common treatment and is typically prescribed with Gilead Science' (GILD)s Sovaldi drug. Gilead is working on an Olysio replacement that will render Olysio's continued growth unsustainable, according to Royal Bank of Canada's Glenn Novarro. "The market is going to gravitate towards that new Solvaldi combination," he said. Obamacare and growth: The company's main growth catalyst could end up being the Affordable Care Act and other factors will boost health care spending in the near future. CEO Gorsky said that things like doctor and hospital visits were still subdued, but he thought that would turn around. Longer term, demographics, and increasing middle class around the world and increasing access to health care under the Affordable Care Act, will translate into more growth for the company, he argued. Despite earnings and revenue that beat Wall Street's predictions, the company's stock is down over 1.5%, although it's still up close to 13% for the year. A number of firms, including Deutsche Bank and Jefferies, view the stock favorably, but the consensus price target is around $108, and the stock now trades at just above $103. There is concern about how much more growth there will be.